In my previous paper, I described how to link a Microsoft Access database to a SQL Server database hosted on Microsoft SQL Azure. By using Microsoft's cloud computing Azure platform, your can easily host an enterprise quality SQL Server database with high levels of availability, bandwidth, redundancy, and support. SQL Azure databases range from 1 to 50 GB, and you pay for what you use starting at $5 per month. In that paper, I showed how you needed to have SQL Server Management Studio (SSMS) for SQL Server on your machine to manage a SQL Azure database and create the data source network file (DSN file) to connect to the SQL Azure database. With this file, your Access database can link (or import) data from your SQL Azure database. So how can you deploy your database to users who don't have SQL Server installed on their machines? Deploying a Microsoft Access database using a SQL Azure database is similar to deploying any Access database using a SQL Server back end database. For our purposes, this can include Access Jet databases linked to SQL Azure tables directly (MDB or ACCDB formats) or your VBA code that references the SQL Server tables via ADO. The users of your applications do not need to have SQL Server installed on their machines, just the ODBC driver. Once that's installed, they can use your database. If they need to link to the tables from their own database, they simply need to have the DSN File you created along with the password for the database. 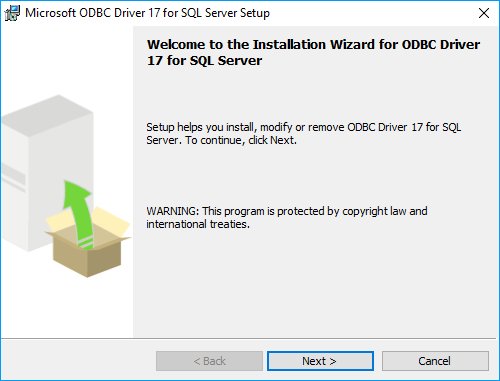 How Do I Install the SQL Server ODBC Driver? Microsoft SQL Server Native Client 11.0 is installed when you install SQL Server 2016 (13.x). You can get the sqlncli.msi from the SQL Server 2012 Feature Pack web page. To download the most recent version of the SQL Server Native Client, go to Microsoft SQL Server 2012 Feature Pack. The version to install should match the bitness of your operating system. NOT the bitness of your version of Access. So if you are running Windows 10, 64-bit with the 32-bit of Office/Access 2016, choose the x64 (64-bit) version. For more details, read this MSDN article about Installing SQL Server Native Client. This article also includes silent installation instructions to install the ODBC driver without the user interface prompting your users. Hope this helps you create Microsoft Access databases with SQL Server more easily. Good luck and I hope to learn what you're doing or would like to do with Access and Azure.